Torah study is the study of the Torah, Hebrew Bible, Talmud, responsa, rabbinic literature and other Jewish religious texts. That which is hateful to you, do not do to your neighbor. 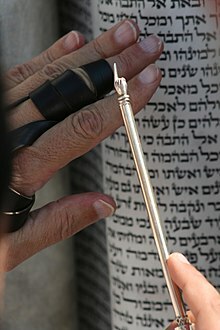 That is the whole Torah; the rest is the explanation. The Pharisees have delivered to the people a great many observances by succession from their fathers which are not written in the law of Moses; and for that reason it is that the Sadducees reject them, and say that we are to esteem those observances to be obligatory which are in the Written Word, but are not to observe what are derived from the tradition of our forefathers. Every Israelite has a duty to study whether he is poor or rich, whether healthy or suffering, whether young or very old and in failing strength, even if he is poor and supported by charity or begs from door to door. For how long is it a duty to study the Law? To the day of death. A learned mamzer takes precedence over an ignorant High Priest. Pharasaic proverb; as quoted by Salo Wittmayer Baron, Great Ages and Ideas of the Jewish People, Leo Walden Schwartz ed., Random House, (1956). Make the study of the Torah your chief occupation; speak little, but accomplish much; and receive every man with a friendly countenance. Without an oral tradition, some of the Torah's laws would be incomprehensible. In the Shema's first paragraph, the Bible instructs: "And these words which I command you this day shall be upon your heart. And you shall teach them diligently to your children, and you shall talk of them when you sit in your house, when you walk on the road, when you lie down and when you rise up. And you shall bind them for a sign upon your hand, and they shall be for frontlets between your eyes." "Bind them for a sign upon your hand," the last verse instructs. Bind what? The Torah doesn't say. "And they shall be for frontlets between your eyes." What are frontlets? The Hebrew word for frontlets, totafot is used three times in the Torah — always in this context (Exodus 13:16; Deuteronomy 6:8, 11:18) — and is as obscure as is the English. Only in the Oral Law do we learn that what a Jewish male should bind upon his hand and between his eyes are tefillin ( phylacteries). Joseph Telushkin, "Jewish Literacy: The Most Important Things to Know About the Jewish Religion, Its People and Its History". NY: William Morrow and Co., 1991; republished in “The Oral Law Talmud and Mishna”, Jewish Virtual Library. When the Sages went to Yavneh they said: The time will come that a man will seek a matter in the Torah but will not find it. He will seek a matter from the Scribes but will not find it. … They said: Let us begin [to record] with Hillel and Shammai. A man of valor is one who is mighty of heart with perfect trust to perform mitzvot at all times and to meditate upon the Torah day and night, even though there is no food or clothing in his house, and his children and the members of his household cry out to him: Provide us with our support and maintenance. And he does not heed them at all, or listen to their cries. Vilna Gaon, Commentary on Mishlei 23:30, in "Separation from the Worldly (Perishut)"
This page was last edited on 12 February 2019, at 00:51.